Christmas Novelties - Lots of Fun and Great Prices! The best idea is to bring a trailer. If you don't have a trailer, or a utility, you can put it on the roof or inside the car. If it's going inside the car you might have fold down seats which should be ok. 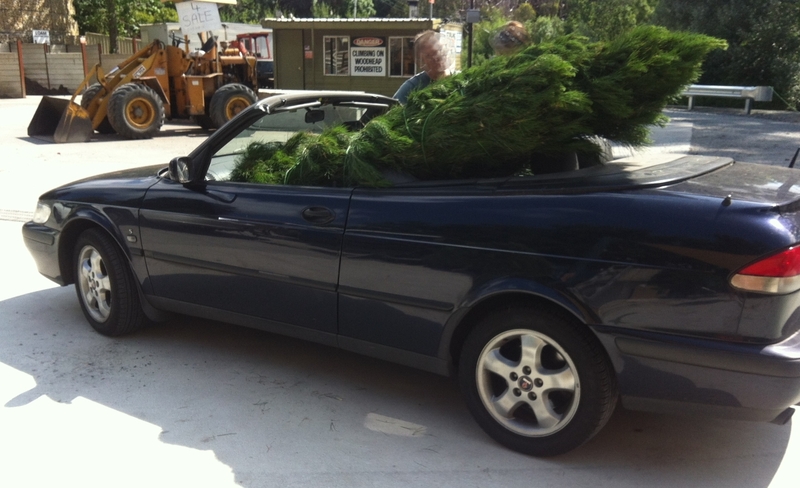 However, if none of the above is available, and you still want a tree, they will definitely fit in your car, and they won't make a mess as they are freshly cut. The best method is to put the base in the corner, and hang the top out of the opposite window. It really works and is fine for getting your tree home. We'll be open 7 days a week for cash sales. Important - Please bring your receipt/paperwork with you when collecting your tree. Ifyou have pre-ordered, you can collect your tree during the week but you must contact us first as we may not have enough trees available on the day to choose from. You will also need to bring a copy of the order/payment to collect your tree.There will be lots of trees on the weekends. We will be open 9am-5pm Mon-Fri. 9am-4pm Sat and 10am-3pm Sun. If you do want to order and pickup mid-week, simply order a pickup for the Saturday and then contact us at sales@adelaidehillschristmastrees.com.au to let us know you'd like to collect it during the week. Join now to stay informed on Christmas tree delivery or pickup. Be the first to know when Christmas trees are available, check updates on fresh deliveries and get tips on taking care of your tree. There'll also be some specials on other Christmas items.